The sun is not up yet on this Monday morning and I have a very tired girl snuggled up beside me. In fact she is snuggled so tightly that I’m having a difficult time typing, typical. Elsa is spent this morning because we enjoyed the weekend in the mountains. Just over an hour from our home in Southern California and we were enjoying the cold and snow. Elsa has her own travel bag which was filled with Ruffwear gear. She’s already worn her travel harness around town but the trip to the mountain would be the big test for her new Load Up harness. I packed up her Hi & Light and Front Range harnesses as well. The Hi & Light would be used under her new Vert coat and when the temperatures went up she wore her Front Range harness alone. We are a Ruffwear family. This harness has substance. Simply putting it on Elsa made me feel like she was safe. One of the things that I love about all of the Ruffwear harnesses is the similarity in them. Elsa wears a medium in harnesses and coats. The difference with the Load Up harness is that the hook up clasps are safety tested hardware. I have hooked her up directly to the seat belt and with a safety carabiner (20 kN (4,496 lbf) rating). Not the kind of 2.99 carabiner you can buy at the cash for your keys. For the trip up to the mountains, Elsa was strapped in the back. There is a seat belt that hangs in the back of my husbands vehicle, like mine. If the seat belts lock up during braking; so does the back seat belt, making it a great safe place to hook up. It also enabled Elsa to move about in the back. When hooking to the back seat; you simply put the seat belt through the loop on the harness. This helps to keep the dog in place, nice and secure. It would be a great piece of equipment for those dogs who like to bound around in the car as well as safety. The harness is easy to put on and hook up. We went from her traveling harness to walking harness in a matter of minutes. 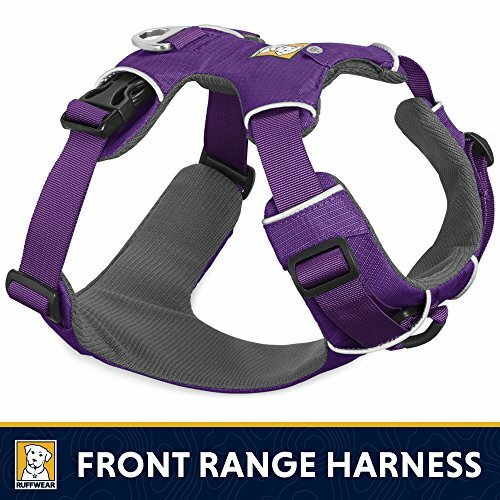 When Elsa was jumping out for a quick pee, it was easy to loop her leash through Load Up harness attachment. Out of 13 different types of canine coats available from Ruffwear, I chose the Vert. Living in Southern California we don’t have a big need for warmth. That is until we head up to the mountains. What we deal with mostly is rain so the Vert was the choice for us. The Vert coat is waterproof and windproof while still breathable. Elsa has a nice thick 1” of fur in the fall and winter which is a wonderful insulation underneath the Vert coat. The coat is put on over the head and then attached on each side. It’s really easy to put on and take off; just like the harnesses. The coat has a waterproof exterior with a thin fleece lining inside. I was blown away at the quality when I first unwrapped and fit it for Elsa. I love that I can still use her Hi & Light harness underneath as it has an opening portal where the hook up is. The two hooks on the side are hidden between layers so that the waterproofing goes way down the sides of her body. The jacket seemed to be made for Elsa; you couldn’t get a better fit . The Vert coat goes right to the base of her tail so she was covered completely. It also has elastic leg loops to keep the coat secure in high wind. But even when they were not used the coat stayed in place for us. 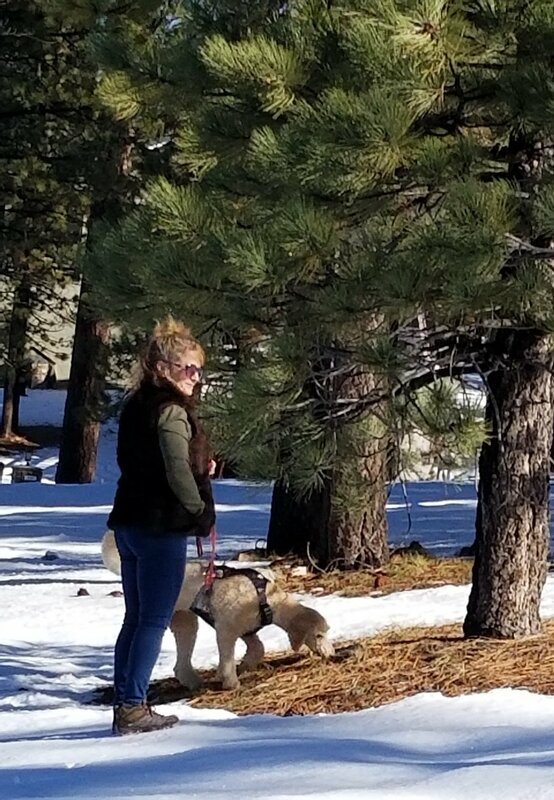 For our trip we used the Hi & Light harness under her coat for walking. The Front Range harness when we went into Bass Pro shop. I like that I can hook it up front in a crowd; and it was so crowded just a few weeks before the holidays. We used the Load Up Harness when traveling and the Vert coat to keep Miss Elsa warm. A big 4 paws up for all of our Ruffwear gear, plus a tail. I love it and highly recommend. Give the gift of warmth and safety to the canine/s in your life.